Due to Yahoo! removing free access to services that are heavily used by the app, unfortunately it's now been removed from the Windows Store. More details on the Brave Location blog. Bedside Clock simply turns your phone into a clock that is always on - perfect for putting next to your bed so you can easily see the time when you wake. 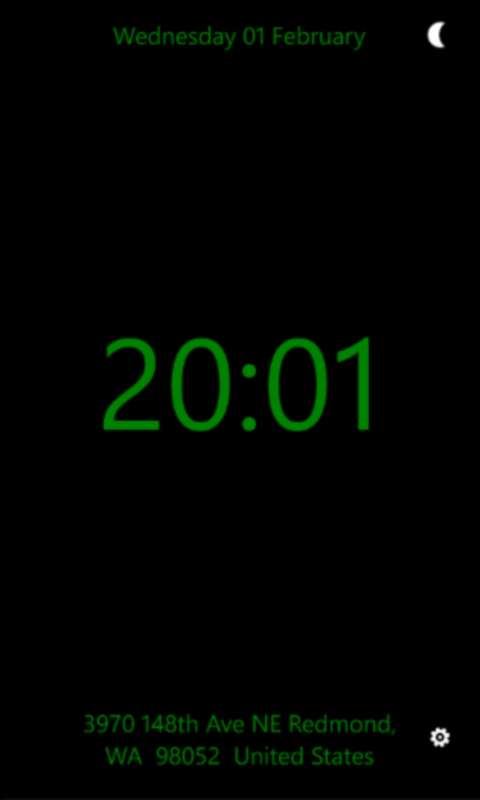 Not the most exciting app in the store - it's just a clock! - but feel free to give it a try! If you have any questions or feedback on the app, don't hesitate to get in touch via my feedback page. Weather icons courtesy of Gavin Elliott. If you're interested in that sort of thing, the source code for the app is now available on Github. Based on some of the reviews in the store, I thought I'd try to answer some of the questions raised there. If you have any other questions, please don't hesitate to contact me. Why did you develop this app? So basically the app was just made for my own benefit, and if anyone else got anything out of it that's definitely a bonus. I wasn't expecting more than a few other people to use it, and am completely shocked it's had over 13,000 downloads so far (as of March 2013). Why doesn't it include an alarm? 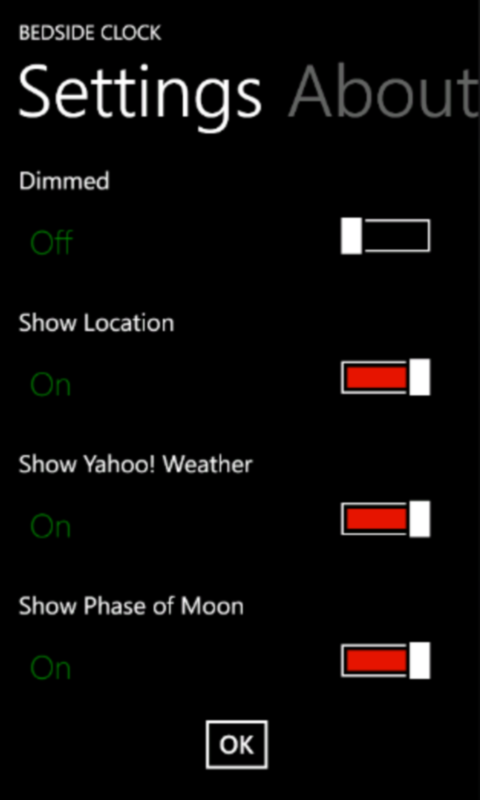 Windows Phone already has a perfectly adequate alarm, and I can't see there is any point in duplicating that in my app. Why did you add in the features you did? Most of them are there mainly because I was interested in writing the code. I mean, outside of the werewolf community, does anyone really care what the current phase of the moon is? 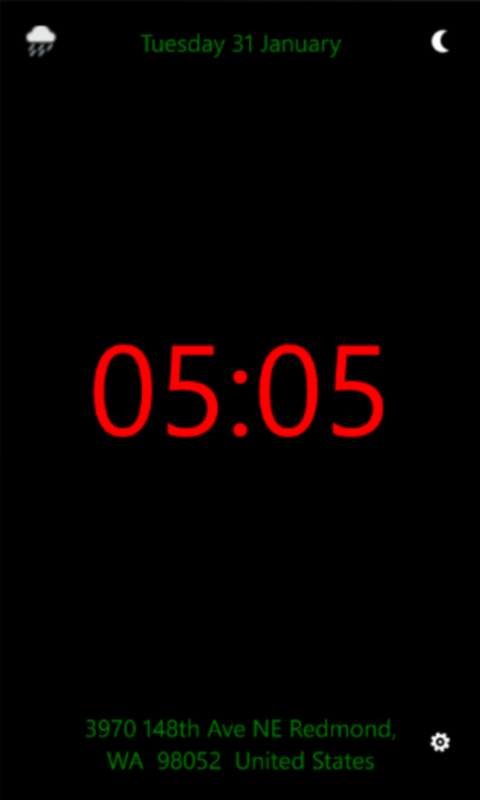 The display color change is there because I'm short-sighted, and it helps me judge how far into the night it is if I wake up without putting my glasses on. Why does the clock drain the battery? Because there's no magic involved here. If you leave the app running and haven't plugged your phone into to the power supply, leaving the display on all night will use up the battery. There's nothing I can do about that, so if you can't put the phone on charge, don't use the app. I do show a warning if start the app and haven't plugged in your charger, and I'm not sure what more I can do. The second version of the app was terrible. Why? Agreed it was pretty ugly. I added an application bar control because I wanted to learn how they worked, but it didn't fit the app UI and if you had the light theme on it made the display too bright. I've definitely learnt from that, and hopefully you like the current design a lot more. What's next for the app? Not a lot I'm afraid. Now the Windows Phone 8 version is in the app store, unless there are any horrendous bugs almost certainly that's the last release. However the code is now open sourced on Github, so if anyone wants to make improvements, or fork the code and do something cool with it I'd be very happy!